Lamps are a common decorating item in the majority of homes. They add ambience, style, light and personality to your home or office and they serve a distinct function as well of adding light to your home or office. There are literally hundreds of different styles of lamps on the market. It can be a real challenge to figure out what you want for your home but we can help. We looked at the 37 most popular lamps on the market and considered their style, size, design, type of power (battery, corded, etc) colors, customer opinions and other considerations as well. The three table lamps we have featured below came out on top in all of the categories we looked at. Any one of these lamps would add style and flair to your home. Table lamps vary in size, design, bulb size, power type and more. They also vary in price from the very cheap to the high cost table lamps that can cost a lot of money. There are several things that you will need to consider when you begin your search for the best table lamp or lamps for your home. This buyer’s guide will help make the decision much easier. Anyone who remembers the Tiffany lamps from decades ago will love this Tiffany style lamp that enhances this mission-style tap. It has many warm tones such as browns, creams, caramel colors and other earth tones. The same techniques that were developed by the creator of the Tiffany lamp, Louis Comfort Tiffany, are used in the creation of this beautiful lamp. The base is dark brown and made of Zinc and the copper foiled glass shade tops it off elegantly. Measurements are 14” x 7.75” with a total height of 22 ½”. The lamps are turned on and off with pull chains and you will need 2 – standard light bulbs, 60 watts each and these will need to be purchased separately. This lamp is UL listed. With this two light, Tiffany style Mission table lamp, you can choose to have both light bulbs on or just use one if you want a dimmer light. The flared design of the lamp shade allows plenty of light to be sent out into the room. Use one on a side table in a small study or purchase two and flank your living room soda. Whichever you choose, this lamp is sure to get attention from all who see it. If your decorating theme is more ocean or beach style, this beautiful lamp will fit right in. 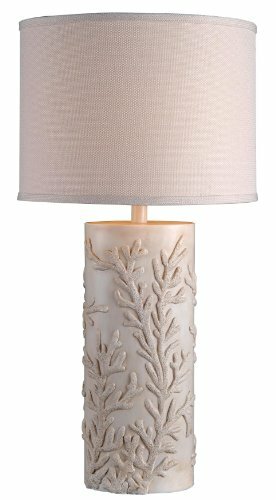 The coral textures of this lamp feature wavy reef designs that are simple yet scream elegance. The white oval lampshade measures 15” in diameter. It is a beautiful white drum style shade in an oval shape. You will need 1- 150 watt 3-way bulb that fits into the socket that has a 3-way switch. The lamp measures 15 x 15 x 30 inches and has an antique white finish that looks beautiful in a variety of decorating themes. Whether you are looking for a great lamp for the bedroom or want to add some elegance and style to your den or living room, this lamp has it in spades. Buy one for a special room or purchase two to flank a lovely couch. 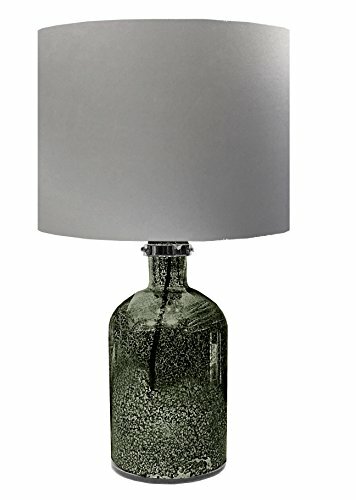 This shiny lamp base will add modern style to your bedroom, dorm room or office. The lamp shade is a neutral color making this lamp perfect for many different types of décor. It is the perfect size for side tables in the bedroom or on an end table in an office, measuring 18 ½” x 12” x 12”. Users should get a 40 watt bulb for use in this lamp and will need to be purchased separately. The unusual design resembles a large bottle and has a little bit of an old style look to it. The gold coloring will go well with many different colors include deep green or burgundy. This lamp may be simple, but it adds elegance and simple class to any room. Finding the right table lamps for your home is an important decision. With so many different styles available to choose from, it can be difficult to choose if you don’t know what to look for. When you know what to look for and how to sort through all of the different table lamps available, choosing becomes much easier and more manageable. The top three rated table lamps featured above are all excellent choices for your home. These three table lamps work well for a side table or end table. Each one has a unique look and style that makes it a popular choice for a bedroom, den or living room. Read more about choosing the right table lamp below in our detailed buyer’s guide. The information in the buyer’s guide is designed to provide you with all the knowledge you need to choose the best table lamp for your needs. There’s more to choosing the right table lamp than just style. You also need to look at the type of power source it has, the size, materials used, and other important factors as well. There are some things you want to keep in mind when it comes to decorating your home with table lamps. These placement tips will give you some guidelines on where to place your lamps for the best results. If you want to get rid of the shadows and dark areas in a room, use several lamps that are placed around the room in different places. End tables and side tables are two of the most common places to set up lamps. Make sure that the lamps match the tone of the room in terms of style, color and size so the lamps fit in to the rest of the room’s decorating theme. If your table lamp is to be used as a reading lamp, you will want to place it close to your shoulder. The bottom of the lamp shade needs to be even with your head. If the table lamp is tall, it should be about two feet away from where you sit to read. If your table lamp is a desk lamp, it needs to illuminate the desk sufficiently so you can work, even at night and have plenty of light on the surface of the desk. The main thing to remember with a table lamp is that it should be no more than 3 feet away from whatever area you are trying to light. This is also why having multiple lamps in a larger room is a good idea since one lamp doesn’t always do well lighting a whole room. The following points are things you need to take into consideration when you are looking for the right table lamps for your home. What size room are you placing a table lamp? – You want to keep the size of your table lamp in line with the size of the room you are placing it into. If the room is larger than 16’ x 20 and has 10’ ceilings, you will want to consider a taller lamp that is taller than 30”. If you’re lighting a smaller room such as a den, bedroom or rec room with a lower ceiling, lamps that are 20” to 26” will work well. You don’t want to place a short table lamp in a large room or it can look odd and not provide a sufficient amount of light. How big is the table you are placing the lamp on? – Again you need to look at proportions. You don’t want to choose a large table lamp for a small table so the lamps take up all the space. Nor do you want to choose a tiny lamp that is dwarfed by the table you are setting it on. Proportion is an important factor in making the room look well balanced and also for providing the right amount of light for the circumstances. Look at the decorating style or theme of the room – You don’t want to choose a table lamp or lamps that completely clashes with the style or décor of the room it is going into. You want to have the table lamps enhance the look of the room not look odd and out of place. Quality is important – You want to always look for quality in anything you purchase. Table lamps are no different so look for well made lamps that have good craftsmanship and materials. Looks are important, but choosing a lamp that is well made and long lasting means you’ll have that lamp for a long time to come. Lamp Shade Design and Material – Lamp shades are the finishing part of a table lamp. You want to be sure that you match the lamp shade to the needs and function of the lamp. If you are using the table lamp to read, you don’t want a lamp that has a dense, heavy shade that blocks a lot of light. If decoration is your main objective, you can choose simply based on the look of the shade and not worry so much about the amount of light it brings into the room. There are many different types of table lamps available for you to choose from. They differ in size, type of bulb, height, design, color and more. We’ve listed the most common types of table lamps. Tiffany Style – Tiffany lamps are works of art. 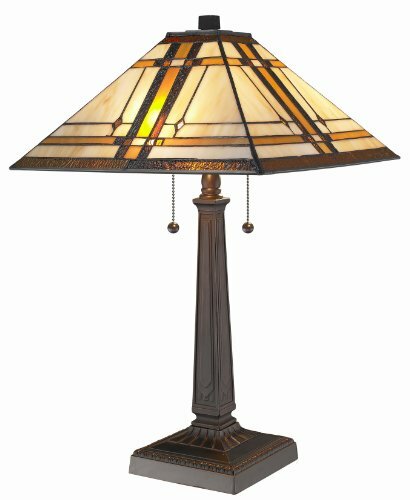 A true Tiffany lamp is going to be an investment but there are many tiffany style lamps available that utilize the same type of construction but are much lower in price. Tiffany style lamps can vary significantly in color and design. The light from the lamp filters through the glass shade and can create quite a few different looks. Glass/Crystal – Glass or crystal table lamps also provide plenty of light to the area they are placed in and most will have some amount of filtering through the body of the lamp simply due to the design of the lamp. They can be simply designed or very intricate depending on your preferences. Glass and crystal lamps come in all sizes and designs, from etched glass to intricate cut crystal designs. Wrought Iron/Metal – There is some beautiful, sculpture like table lamps that are made out of wrought iron. It goes well with a country style theme or some other type of design that utilizes a lot of iron and more dramatic styling. Stainless steel is another metal that is common, especially when it comes to more modern designs. It is sleep, simple and still functional and stylish as well. Wood – Many table lamps are made of wood in various forms. Wood bases are simple and go with many different design types. They can also be intricate and carved masterpieces as well, depending on what you are looking for. There is a lot of variety that can go into a wood table lamp design. Light Source – Depending on the type of table lamp you purchase, you may need to get a certain type of bulb or certain wattage as well. This will be listed on the lamp that you choose. Some allow incandescent to be switched out with environmentally conscious designs like CFLs and others will have to be more specific. The information on which type of light source to use will be on your lamp’s description and/or packaging. Style – Table lamps will be the center of attention in most cases. Take the time to choose the right one for the room you are placing it into, including colors, designs, shapes, and other factors to make it something that stands out in a classy way not something where people are wondering why you have that lamp in the room. UpKeep – You will want to keep up with the maintenance of your table lamp, mainly cleaning. Make sure that you read the instructions on how to keep the lamp clean and how to clean it if it does need it. Never immerse a lamp in water. Choosing the right table lamp for your room or rooms takes a little bit of planning and research but there are some beautiful styles and themes available that can make a real statement in the rooms you are decorating. With so many styles to choose from, you will be able to really show your own personality and find table lamps that compliment each room you are placing them into. With all of these choices available, you will be able to have fun searching and will know the important factors to look for.